I’m always a bit amazed by how long The Defenders lasted as a series. For an admitted secondary team, though one with compositional characters that had a bit more gravitas than the Champions roster, they really had some legs. What, the pissed wife didn’t have an umbrella to whack poor Melvin over the head with? Those two guys don’t seem like they’d be the best balms to soothe a woman’s soul, but hey, the man’s a doctor. 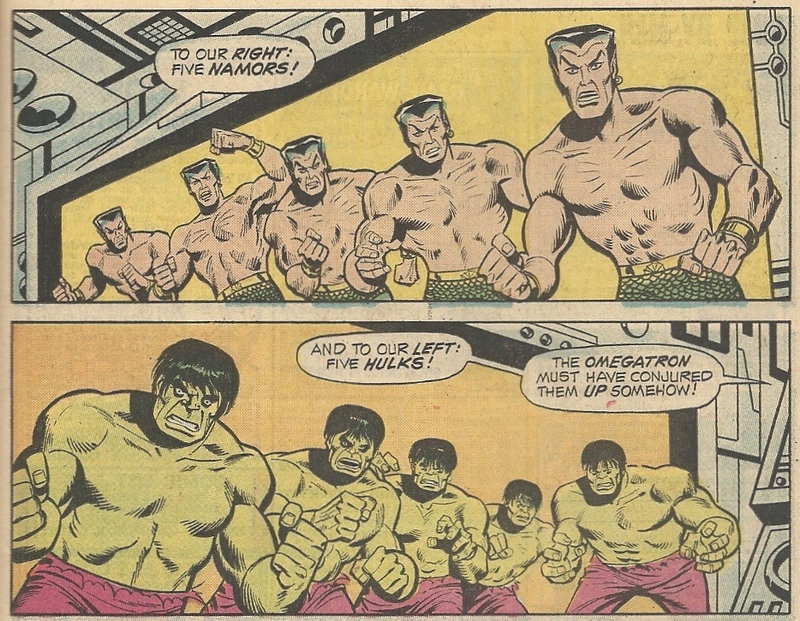 Add “SLURGE!” to the earlier “SLUD!” in the list of this issue’s delightful sound effects. 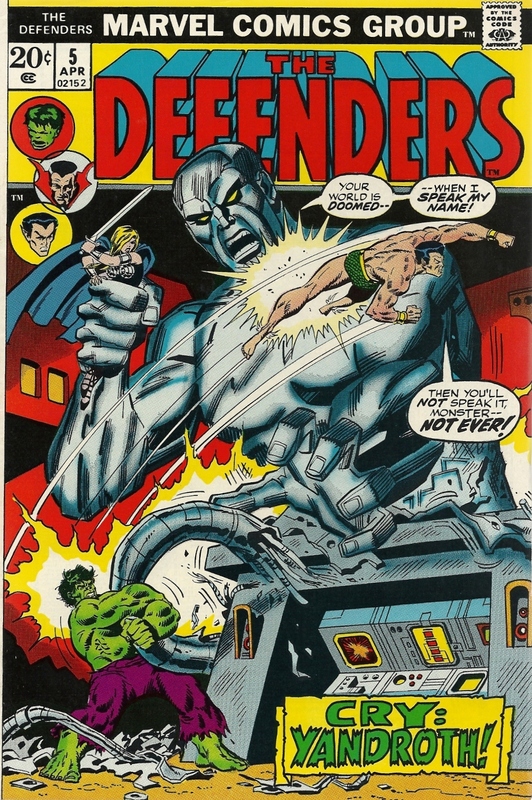 I can’t say that I’ve ever been much of a Defenders fan. Though the eclectic blending of personalities could spark some fireworks, like every other non-Avengers book it comes off as lesser, watered down version of that (usually) higher-caliber roster. 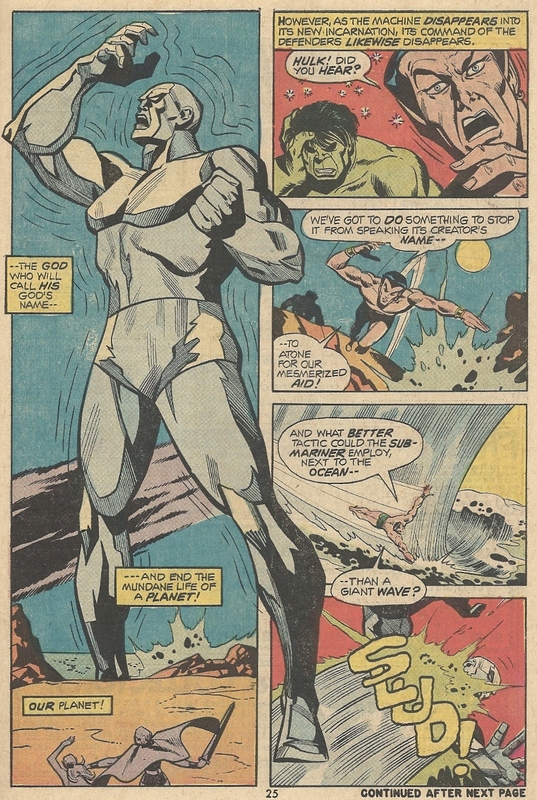 Things were a little better in my eyes when the Silver Surfer joined the Defenders line-up later on, but the tale in this issue is typical of the “meh” vibe that pervades so many of the title’s earliest days. There were later arcs that had quality, but I’m a bit amazed that the title lasted long enough to reach that point. 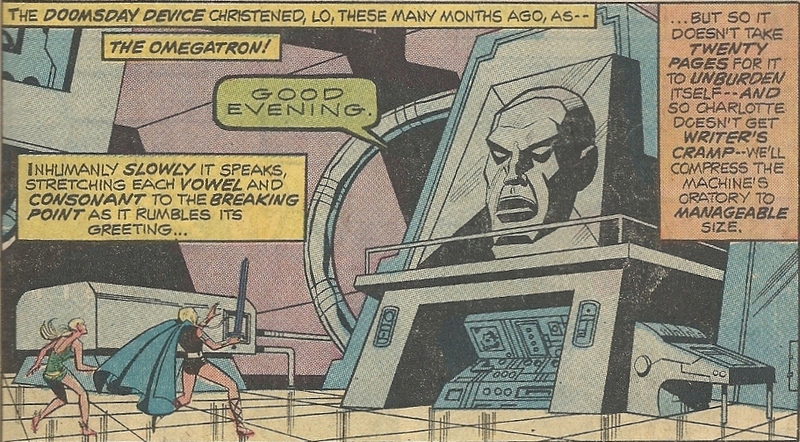 Perhaps the Valkyrie and her simultaneous satisfaction of multiple fetishes had something to do with the staying power. Maybe. ← No! Not that! Anything but that! 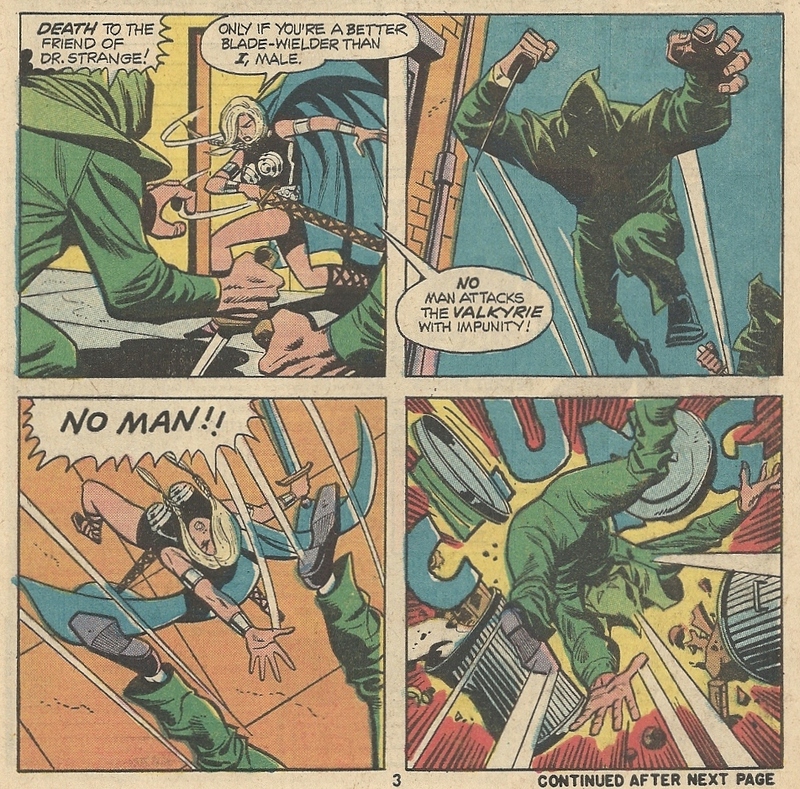 well, if I may be redundant and defend the defenders–when they had creative people behind them, it was a great book–the Englehart run was not bad (and Frank McLaughlin never got the credit he should’ve for making S Buscema look so good), the Giant-Size #2 had great Kane/Janson art, the Gerber run was particularly memorable, some great Keith Giffen (both with and without Janson) issues–after Dave Kraft left, it was very hit-and-miss, despite a few interesting bits by Ed Hannigan and some terrific Knowlan covers. As I said (I think), they had their moments. I’m just surprised they lasted long enough to have moments, if that makes any sense. A lot of issues carried that “And?” feeling, where you feel that there should be something more and there isn’t. Then again, the bulk of the run was before my time, so perhaps I shoudn’t be the one to judge (nostalgia can conquer all). I’ll second the excellence of Gerber’s run. 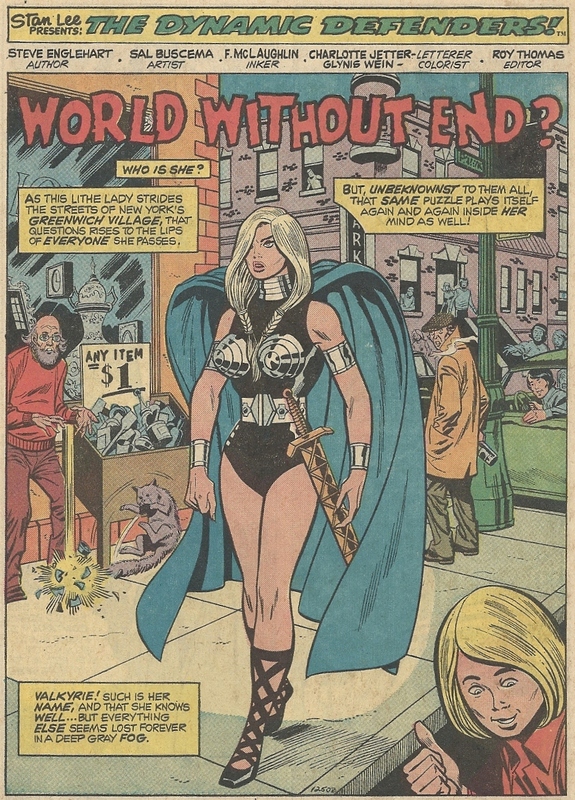 Funny about Valkyrie–I swear about every third issue starts off with her wandering the streets randomly until she runs into trouble. 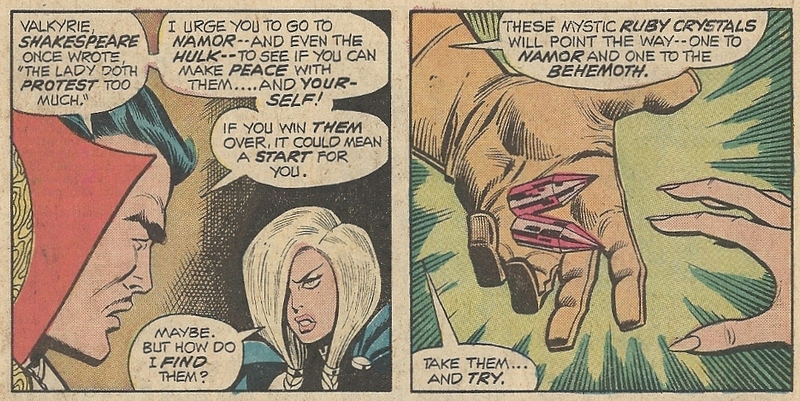 I’m quite certain that’s how the Sons of the Serpent storyline starts off (issue #21?). 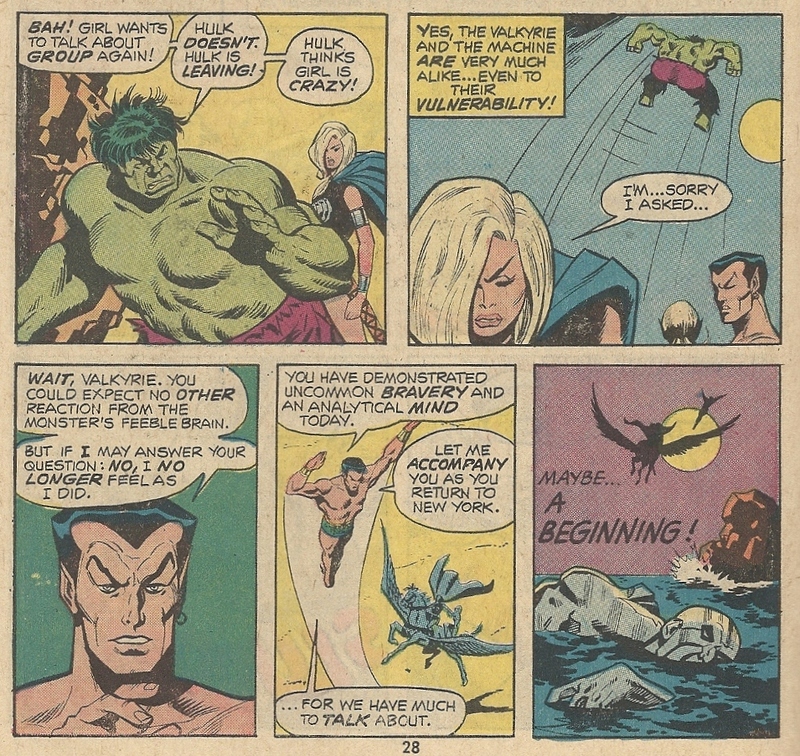 If you get the chance, check out the first Valkyrie appearance in Hulk #142; it’s a hilarious homage to Tom Wolfe’s Radical Chic.